Guide wedding guests to your ceremony and reception locations using stylish wedding signs. They'll appreciate the kind gesture and you'll love having another way to show off your unique wedding style! 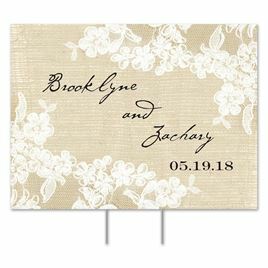 We even offer personalized yard signs so you can add your names and wedding date to make it truly yours. Looking for other unique ideas for your wedding reception? We recommend looking through our wedding reception decorations for some fun ideas.